Wade Malley scored as Racing Club Warwick came from behind to draw 2-2 with Cadbury Athletic in midweek. 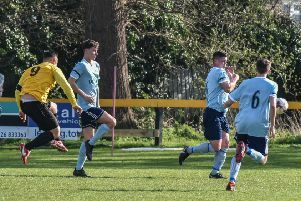 Racing Club Warwick were unable to extend their three-game winning streak at home to Cadbury on Tuesday and for all their possession and attempts on goal, were fortunate to come away with a point. Luke Cole opened the scoring in the 25th minute with a shot that squirmed into the corner but despite dominating possession, Warwick looked toothless in the attacking third. Cadbury equalised in the 35th minute with a free-kick from former Racer Dan Dineen and went ahead with a fine 52nd-minute strike from Lewan Toban which stunned the 157 crowd. Wade Malley entered the fray in the second half as Racers laboured for an equaliser and the substitute, making his way back from injury, produced a calm finish into the corner after a fine run down the right. Racing Club travel to Malvern Town in the FA Cup preliminary round on Saturday and manager Scott Easterlow believes despite the disappointment of midweek, his side can shock the West Midlands League Premier Division side. “We go into the game having watched Malvern and if we perform how we can then it’s a game we can win,” he said. Should there be a result, Racers will welcome Paget Rangers on Bank Holiday Monday. However, if the FA Cup game requires a replay, it will be held at Townsend Meadow on Tuesday evening. Cole picked up a nasty cheek injury which required stitches and is a doubt but Ben Mackey is expected to return from injury, while Adam Knight is pushing for a start after rejoining from GNP Sports.